Mary Mattingly waters plants on Swale. Image courtesy RAVA Films. It’s time for another round of Ask an Artist! Submit to the A Blade of Grass Magazine advice column by emailing info@abladeofgrass.org by May 15. Read the Issue 1 column online here. Our next columnist will be artist Mary Mattingly, whose imaginative work challenges environmental and economic norms and policy by enacting alternative systems. 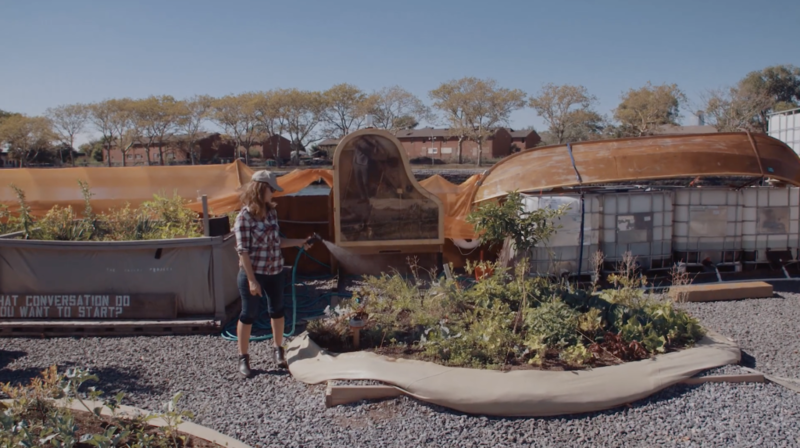 As an A Blade of Grass Fellow in 2015, Mary created the floating mobile food forest Swale, where food crops are grown on a barge in public waterways to circumnavigate New York City public land use policy against foraging on city property. A Blade of Grass Magazine Issue 3 will explore how socially engaged art can challenge normativity through the ambitious and imaginative creation of alternatives, or by lifting up and affirming the experience of those at the so-called margins to work towards transforming our society to become more just and inclusive. Have you been parsing a new idea, wrestling with a question, or coming up against a challenge when it comes to addressing normativity in your own art practice or elsewhere? Ask Mary!